^ 4.0 4.1 Rank, Michael. Lifting the cloak on North Korean secrecy: The Cleanest Race, How North Koreans See Themselves by B R Myers. Asia Times. 10 April 2012 [13 December 2012]. ^ 5.0 5.1 Hitchens, Christopher. A Nation of Racist Dwarfs. Fighting Words (Slate). 1 February 2010 [23 December 2012]. ^ So & Suh 2013, p. 107. ^ 国外社会主义国家的最新探索. 东方早报. 2013-11-05. （原始内容存档于2015-07-23）. ^ 肖枫. 社会主义向何处去：冷战后世界社会主义运动大扫描. 当代世界出版社. 1999年: 387-388. ISBN 7801151542. ^ 我的国家. 김정일장군의 노래. （原始内容存档于2016-02-21）. So, Chae-Jong; Suh, Jae-Jung. 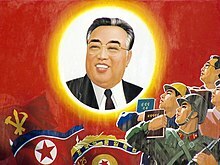 Origins of North Korea's Juche: Colonialism, War, and Development. Rowman & Littlefield. 2013. ISBN 0739176587. This page is based on the Wikipedia article 朝鲜劳动党; it is used under the Creative Commons Attribution-ShareAlike 3.0 Unported License (CC-BY-SA). You may redistribute it, verbatim or modified, providing that you comply with the terms of the CC-BY-SA.